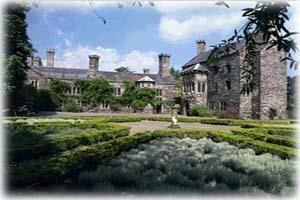 Gwydir Castle is situated in the beautiful Conwy Valley and is set within a Grade I listed, 10-acre garden. Open Wednesday to Sunday (plus Bank Holiday Mondays) 10am-4pm from 1 April - 31 October. 2017 Prices: Adult £6.00, Concessions £5.50, Child £3.00. From the A5 at Betws-y-Coed, take the A470 north towards Llandudno/Conwy. On entering Llanrwst, turn left over the river bridge on to the B5106 and left again - signed to the Castle.